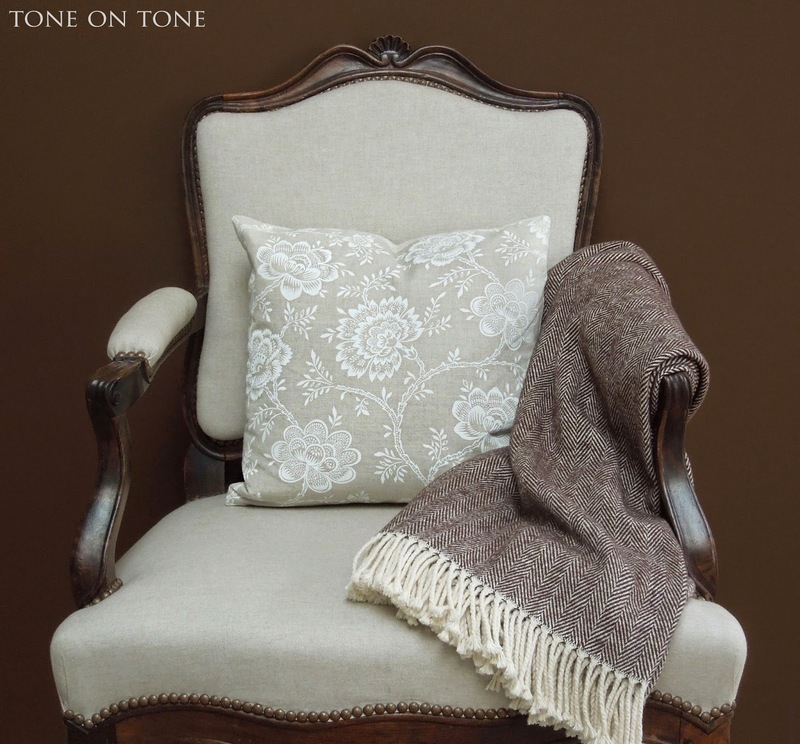 During this time of year, I always think of the color brown - rich, warm and cozy just like my favorite winter throw. Outside, autumn's vibrant hues have all turned brown. Speaking of outside, it has been absolutely frigid, the kind of weather perfect for indulging in hot cocoa. I love that shade of deep chocolate! Of course, Thanksgiving would not be complete without a delectable golden-brown turkey with plenty of gravy. 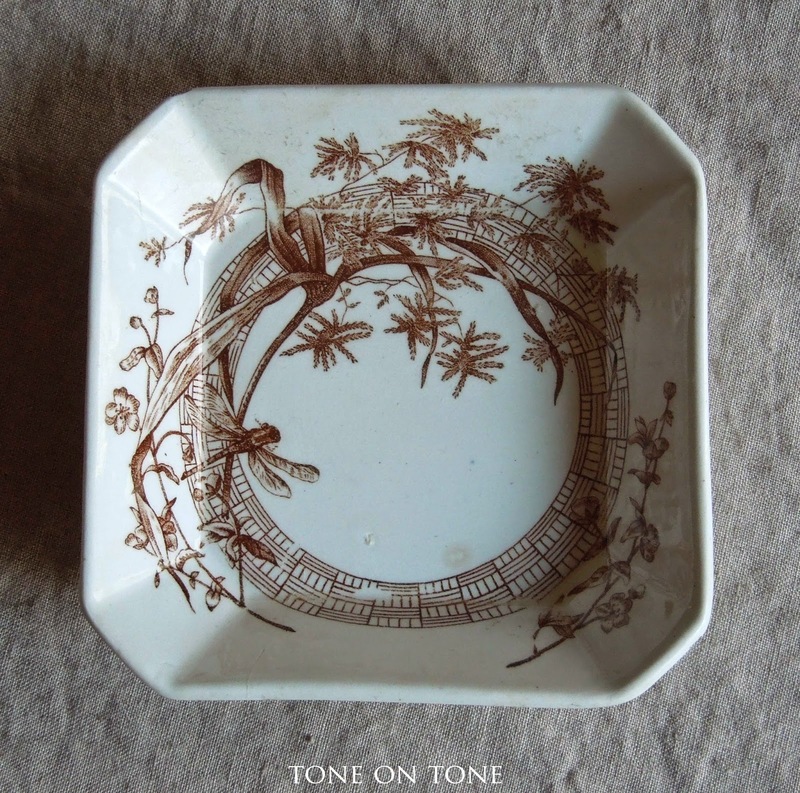 And, this is the time of year I bring out my brown transferware. 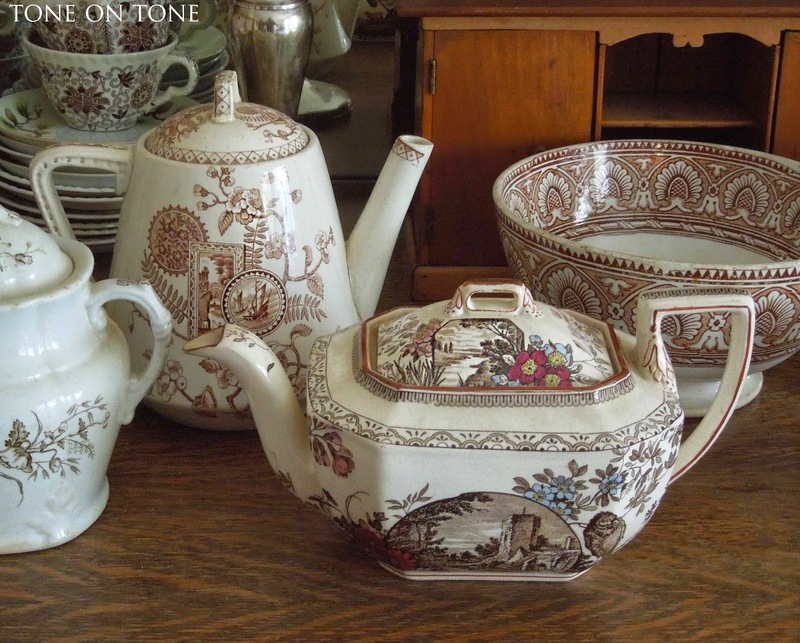 As regular readers know, I have a weakness or, a few might say, a sickness when it comes to collecting antique china. 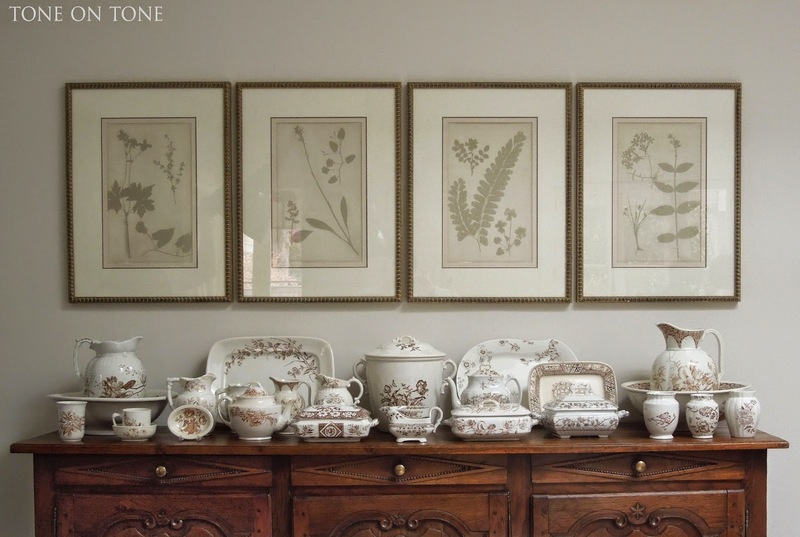 Since yours truly has accumulated so much ironstone, creamware and transferware, rotating the collections is a necessity: bring some out, put some away. It's the only way to live with such an obsession. 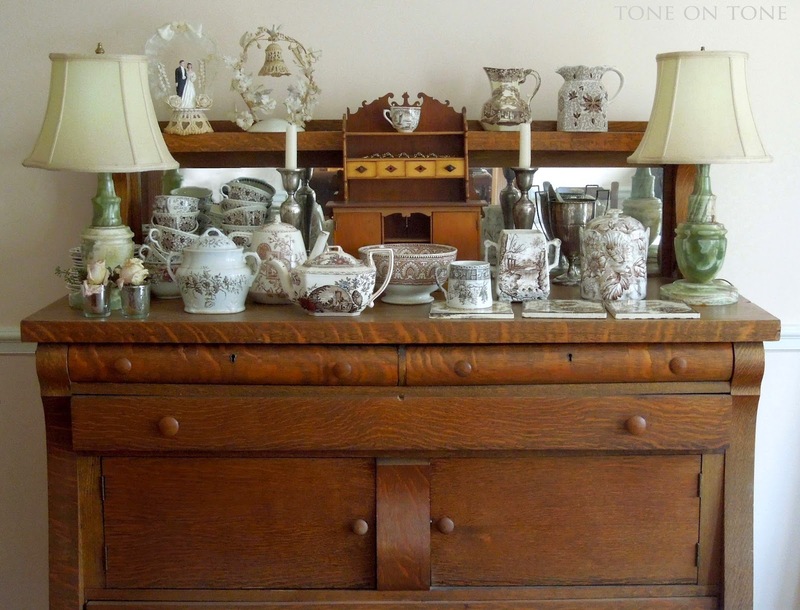 When it comes to displaying, I practice what I call "contained clutter." Pile it on en masse and group the pieces all together. 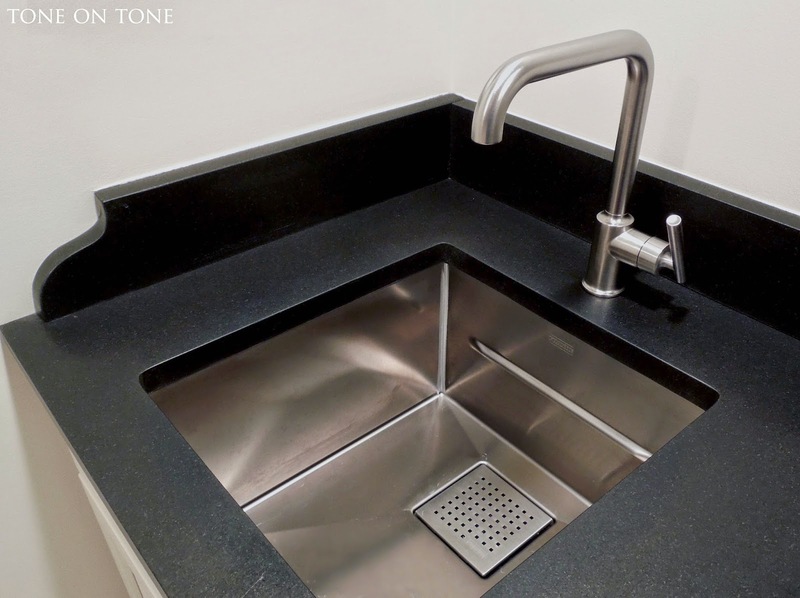 This creates more impact than a scattering of individual pieces. 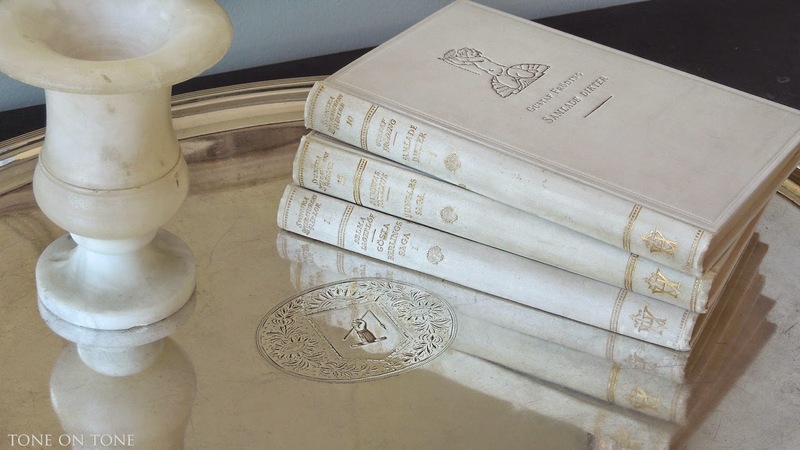 Most of these date from the late 1800s during the Aesthetic Movement or Aestheticism, a period that championed the philosophy "Art for Art's Sake." 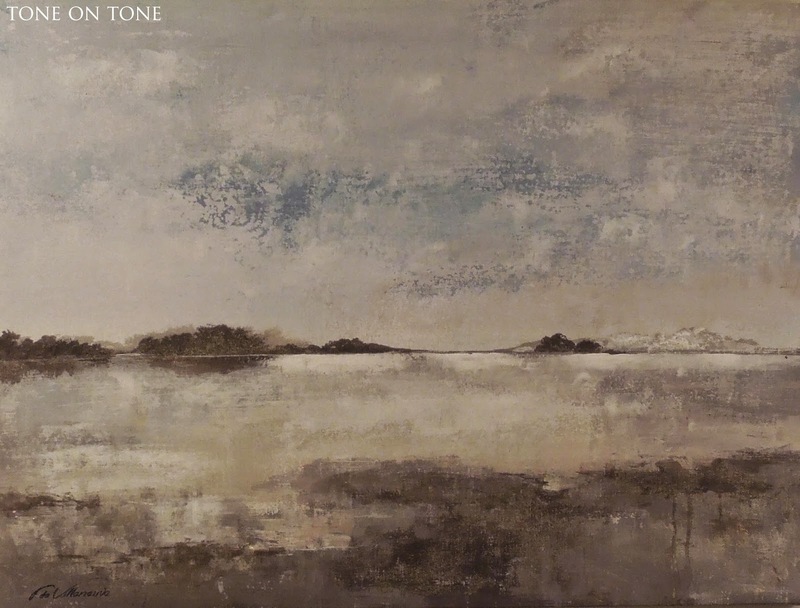 Artists believed that beauty alone was reason enough for the creation of their work - a departure from having to justify meaning, purpose and value. 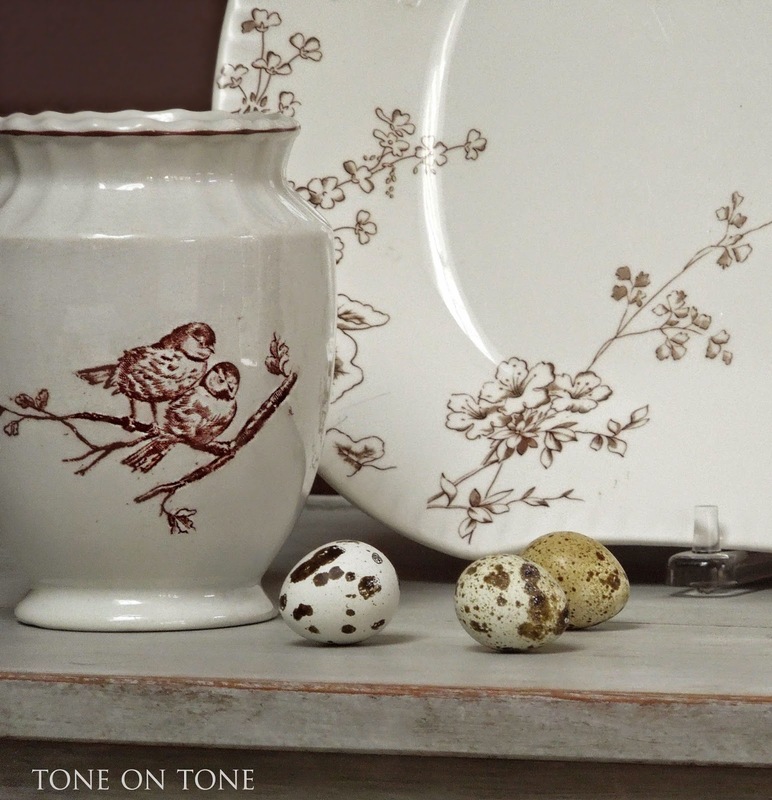 In transferware, this freedom of expression resulted in free flowing asymmetrical designs, exotic Oriental influences, and exuberant blooms plucked from nature. 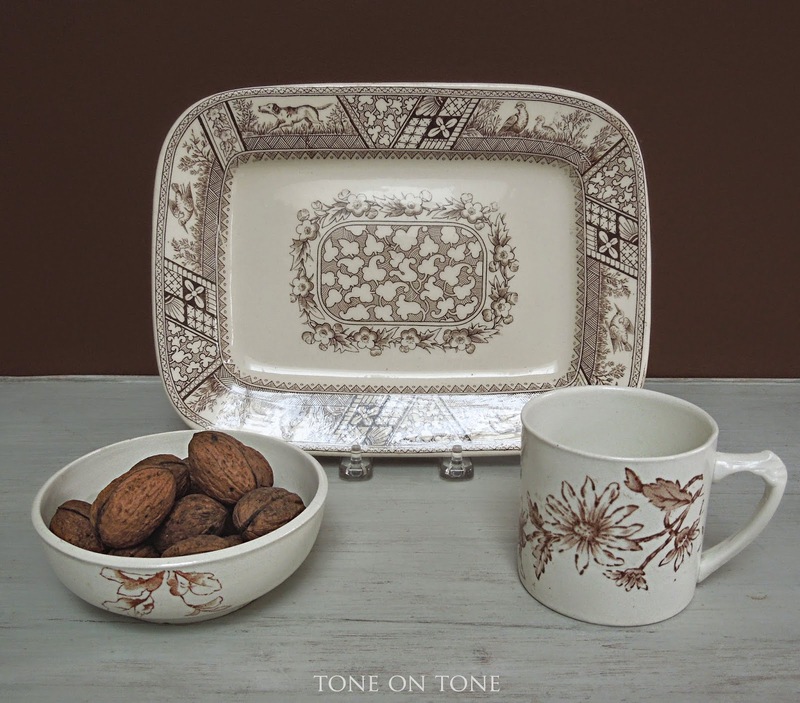 Here is a pretty serving platter in the Petunia pattern by Johnson Brothers of Staffordshire, England. Note its unusual asymmetrical shape. 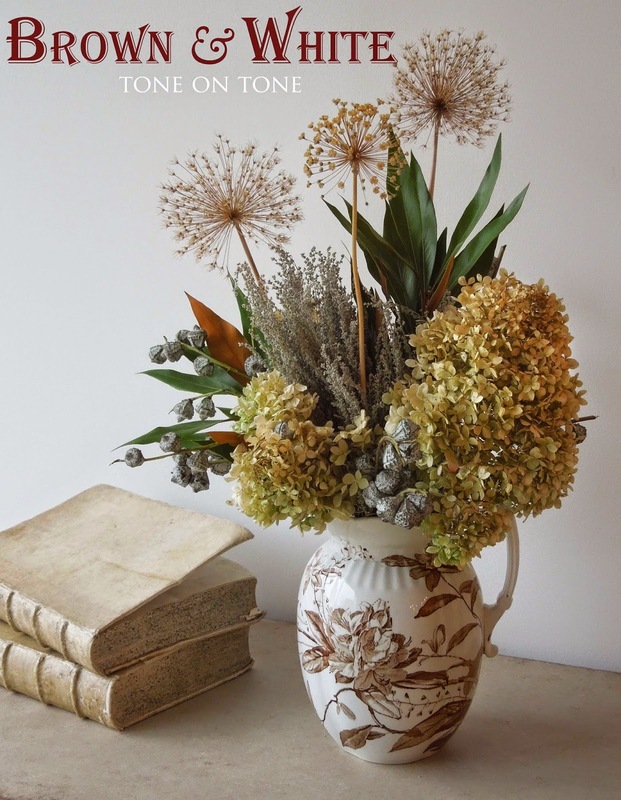 A pair of love birds decorate this vase made for holding hat pins for the fanciful Victorian lady. 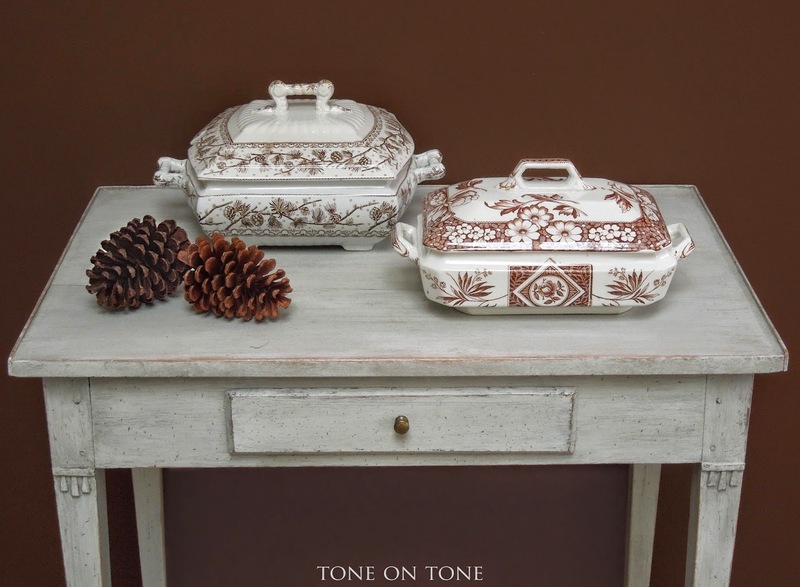 ABOVE: Two vegetable or casserole covered tureens from the Aesthetic Movement. 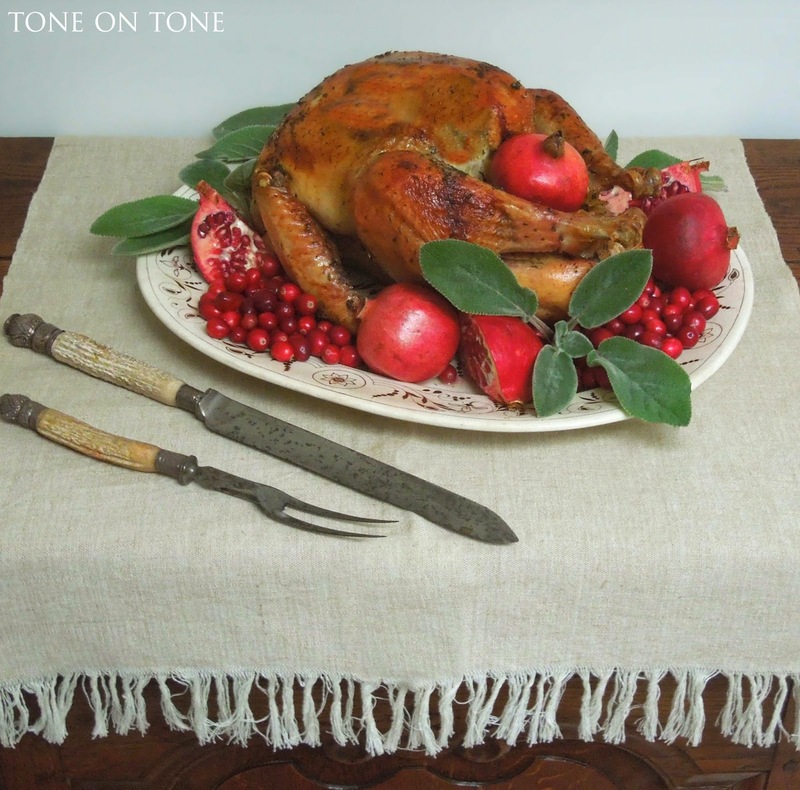 The larger one is bordered with festive pinecones - perfect for holiday entertaining. 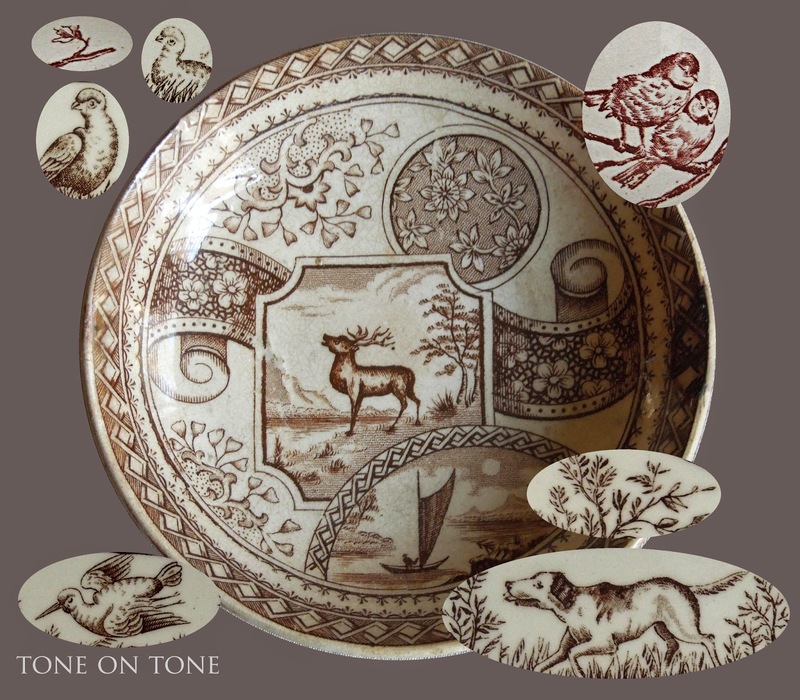 BELOW: A small serving platter featuring a country hunt scene complete with dogs and pheasants. 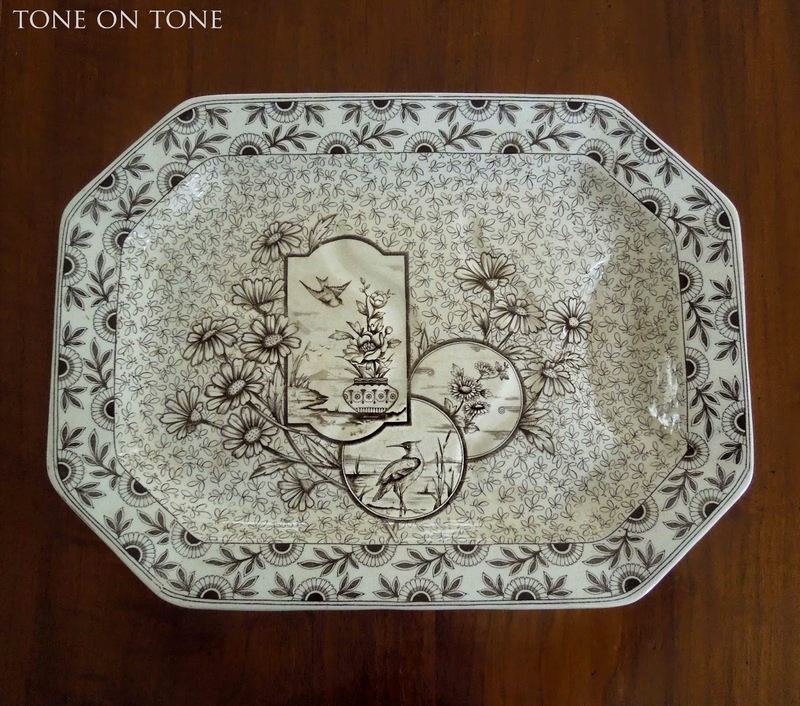 -Oriental, especially Japanese, motifs such as bamboo trees, chrysanthemum blooms, fans, etc. 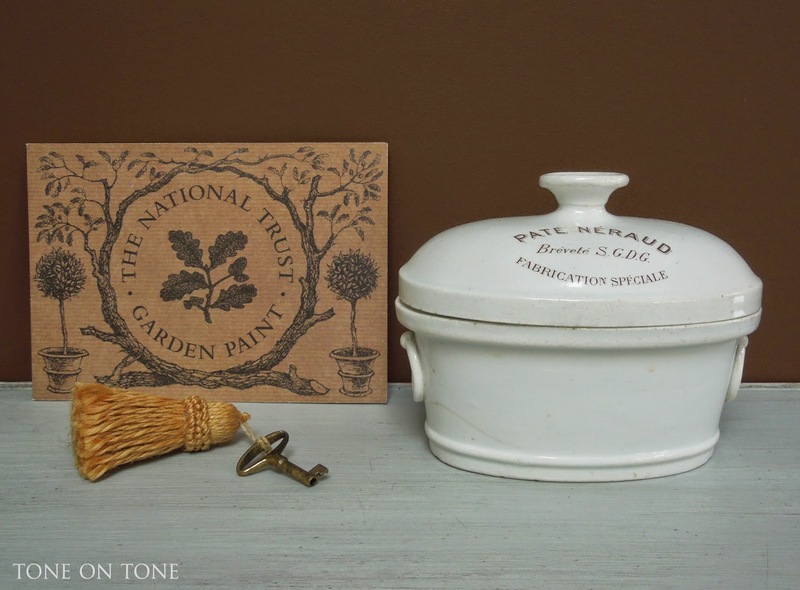 Though not related to Aestheticism, I love this French ironstone pate keeper with brown lettering. 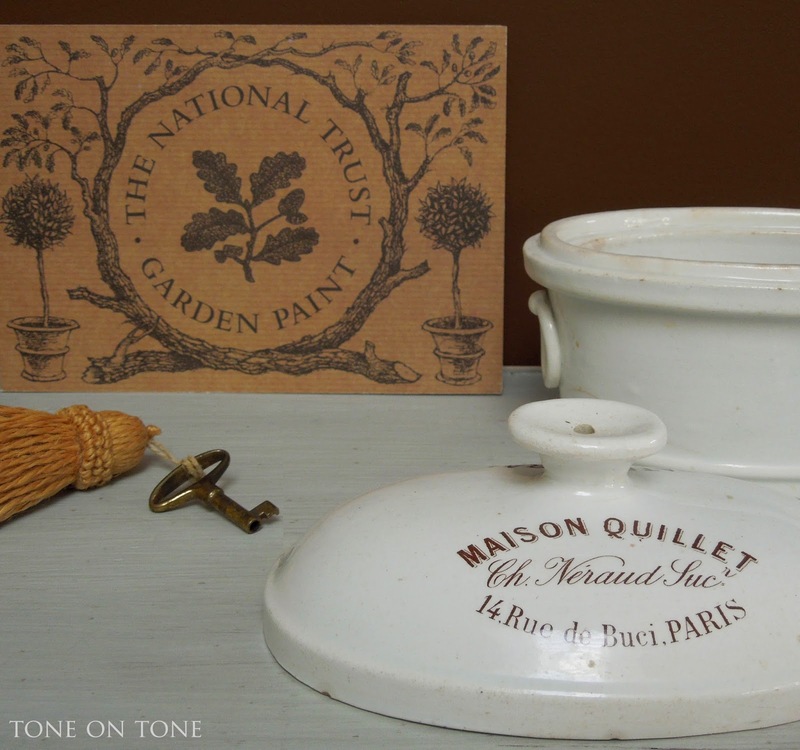 It was made to advertise Maison Quillet's pate - delicious I would assume! 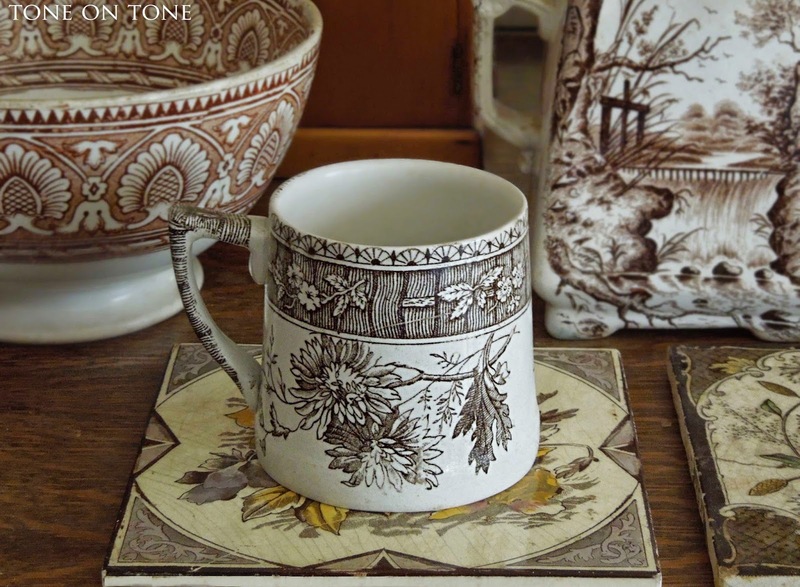 I couldn't write about brown transferware without showing my good friend Ellen Seagraves' enviable and eclectic collection. 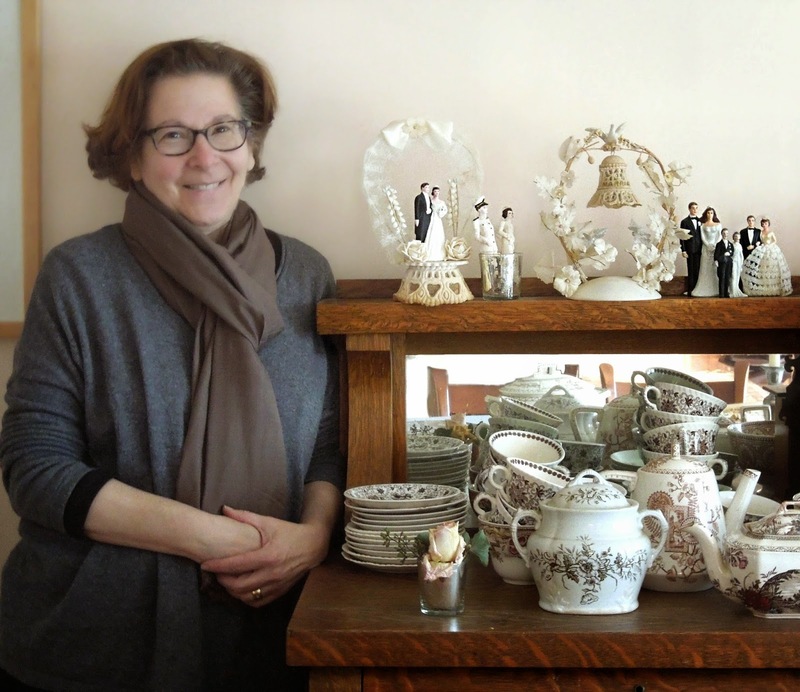 In addition to being a gifted florist, Ellen is a passionate collector. I've shown her work before in this post. Enjoy this mini tour of her home. My favorite piece from Ellen's fabulous collection is this well-and-tree (for catching juice) meat platter with little postcard-like images overlapping each other - it reminds me of a scrapbook. ABOVE: A butter pat with a geometric ring hiding a dragonfly. 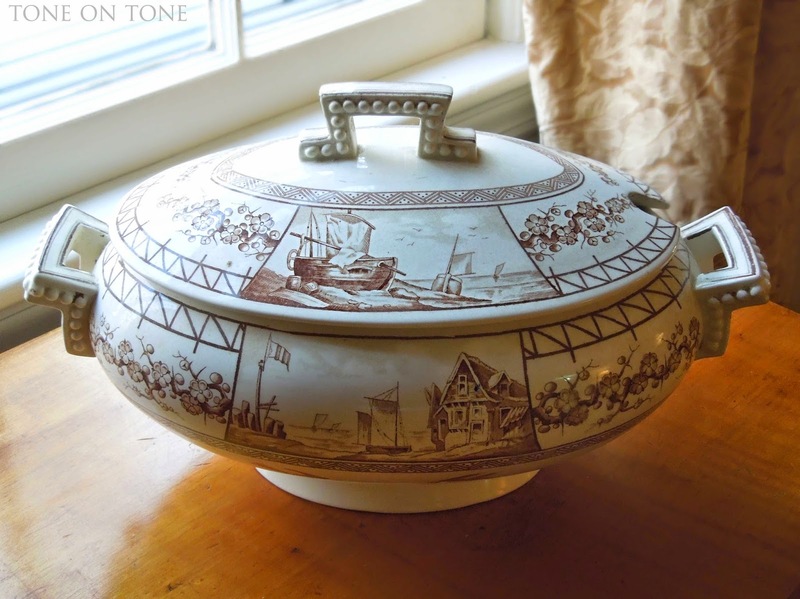 ABOVE: This prized covered tureen has unusual beading on the handles. 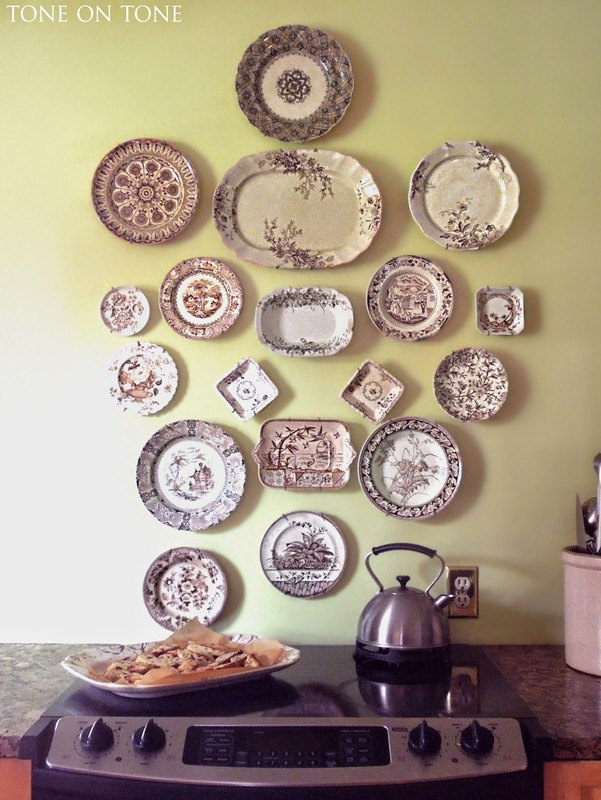 BELOW: A display of plates, platters and butter pats create a focal point in the kitchen. Tom and I have been tasked with bringing the turkey to my family's gathering. And since Tom has never roasted a turkey (and I can't cook), we decided to do a test run with a 13 pound bird. 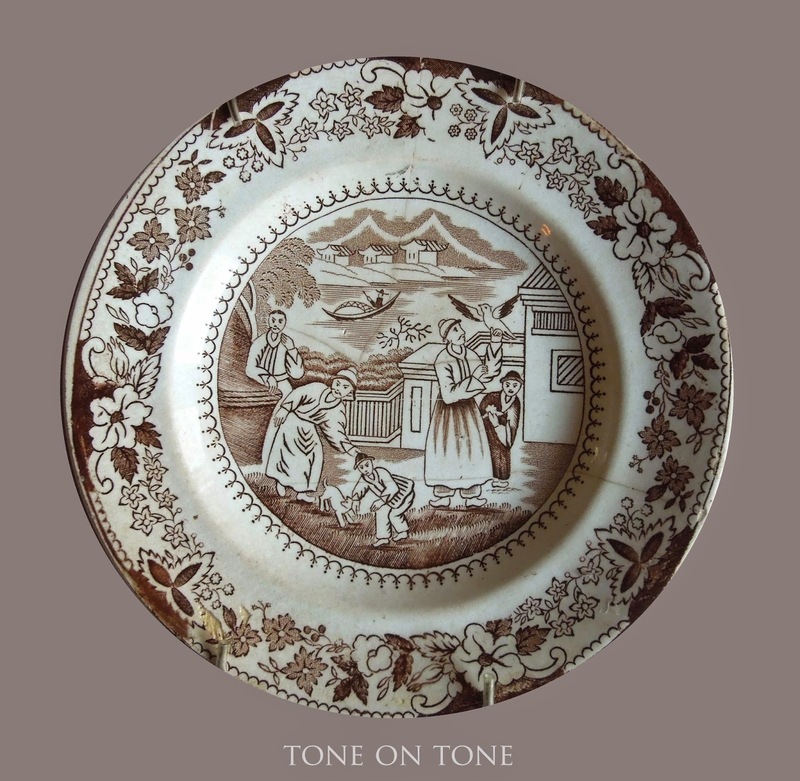 I picked the platter which was my very first brown-and-white piece found on Portobello Road in England almost 20 years ago. Basement...just that word itself is depressing! 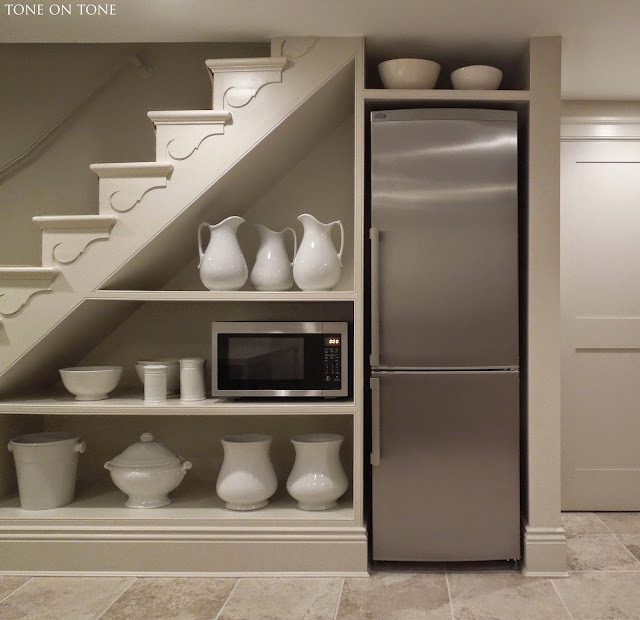 For many of us having basements, they are often times treated as low priorities on the decorating list. It ends up being relegated as a someday project. Well, that someday came for Tom and me. 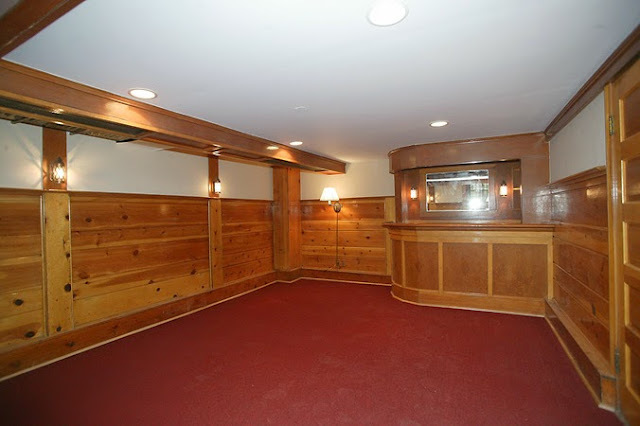 When it came time to renovate our basement, Tom gave me a crazy budget and a crazier deadline: finish it by next month! Not quite but something close. 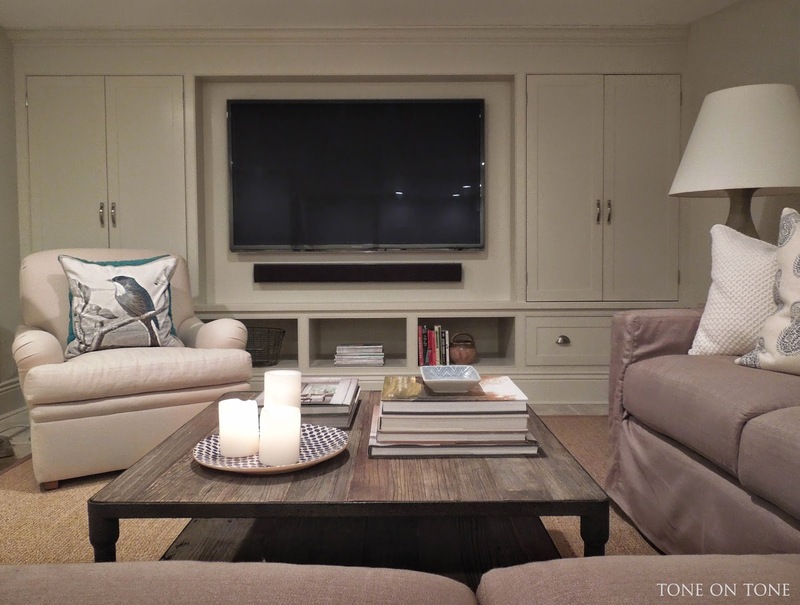 Oh, one more thing: Tom wanted it to be his man cave for watching sports (gross!). But I have my mini conservatory to grow topiaries, so that's cool. You should know that our basement has low ceilings with tricky ductwork everywhere and, unfortunately, only one window. So no natural light, which is perfect for watching TV. -Had the ductwork, pipes and wiring consolidated. -Designed one open sitting room with big TV and kitchenette. -Created a guestroom with ample closets. -Enlarged the half bath to full bath. And here is our sitting / TV room all finished. It needed to be casual and comfy. 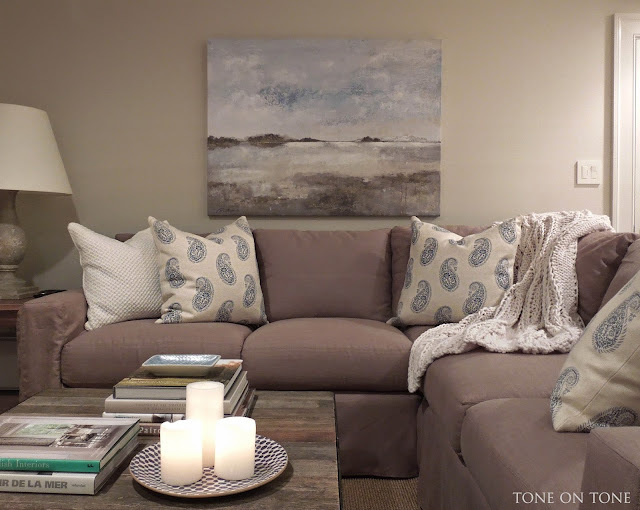 Due to the lack of sunlight, a palette of whites and grays would've been dreary. Instead I went with warm taupes, browns, beiges, tans and blues. 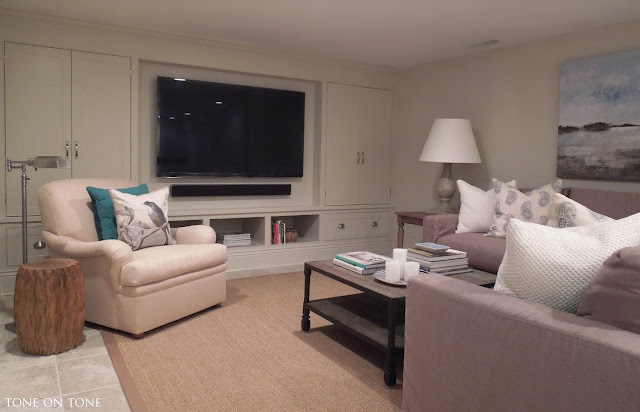 I designed a custom built-in for the TV - it also conceals HVAC ductwork. I did splurge on the TV and built-in, but it's money went spent. 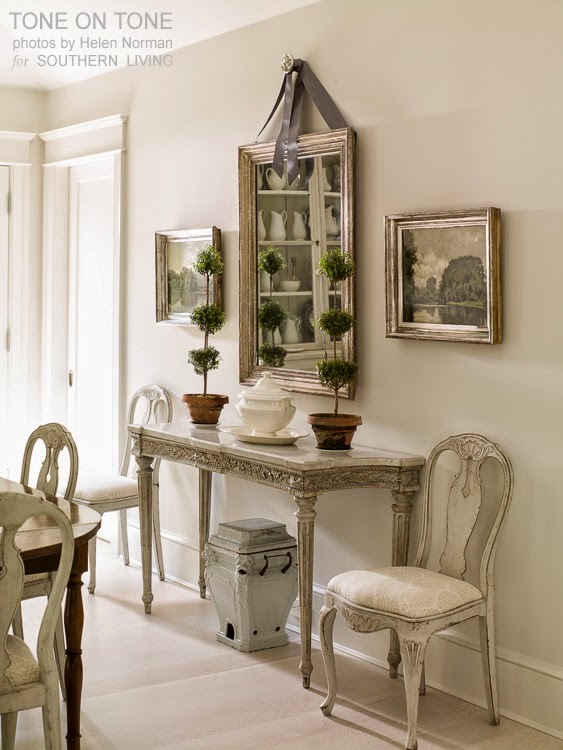 Walls, trim and built-in are all painted the same color for a seamless effect. 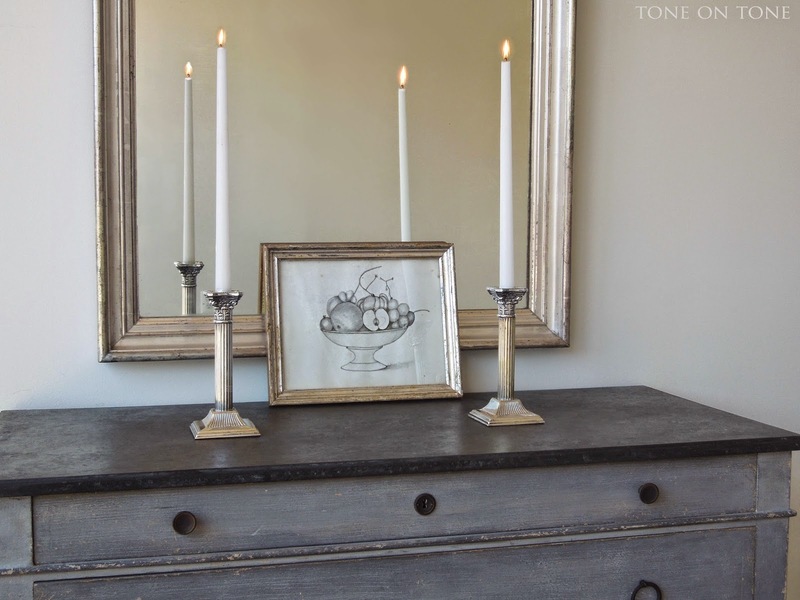 Walls are Benjamin Moore 75% Edgecomb Gray (HC-173) flat finish. 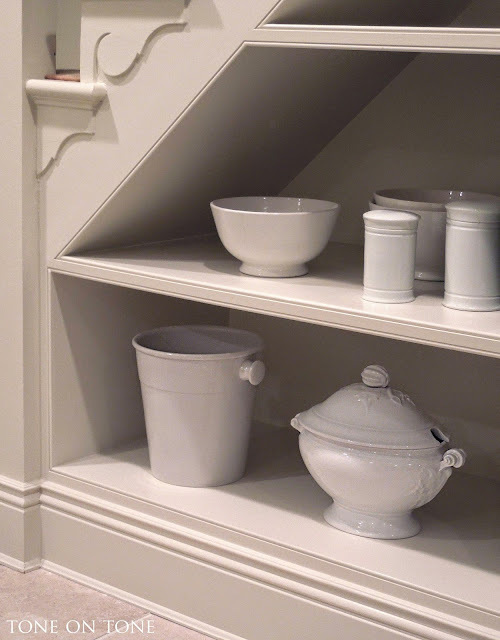 Trim and built-in are in Satin Impervo low lustre paint. My awesome friend Meredith gave me this beautiful clubchair from Edward Ferrell. Many thanks, Meredith!!! 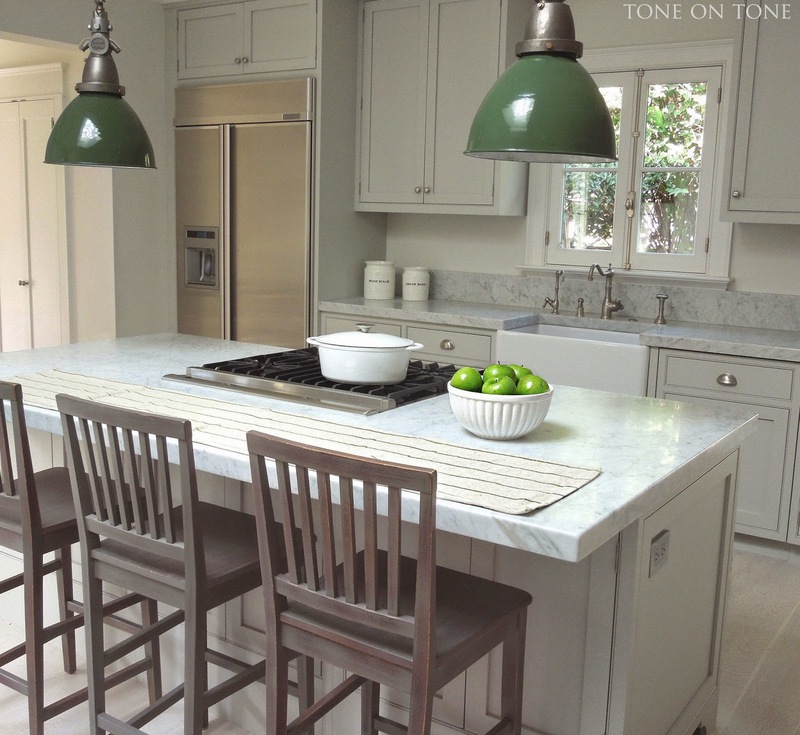 Someday I'll share her drop dead GORGEOUS home on the blog. 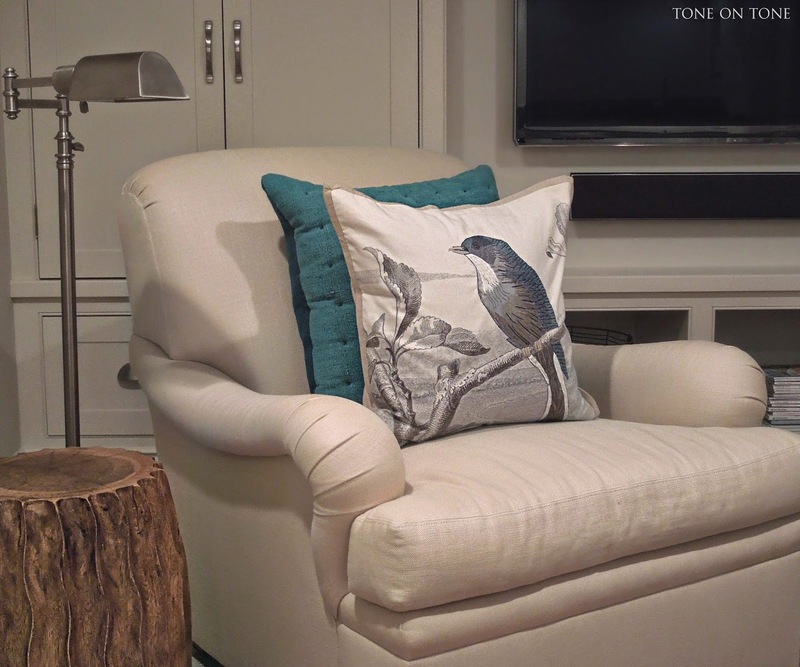 Bird pillow is from Pottery Barn and teal one is from Crate and Barrel. 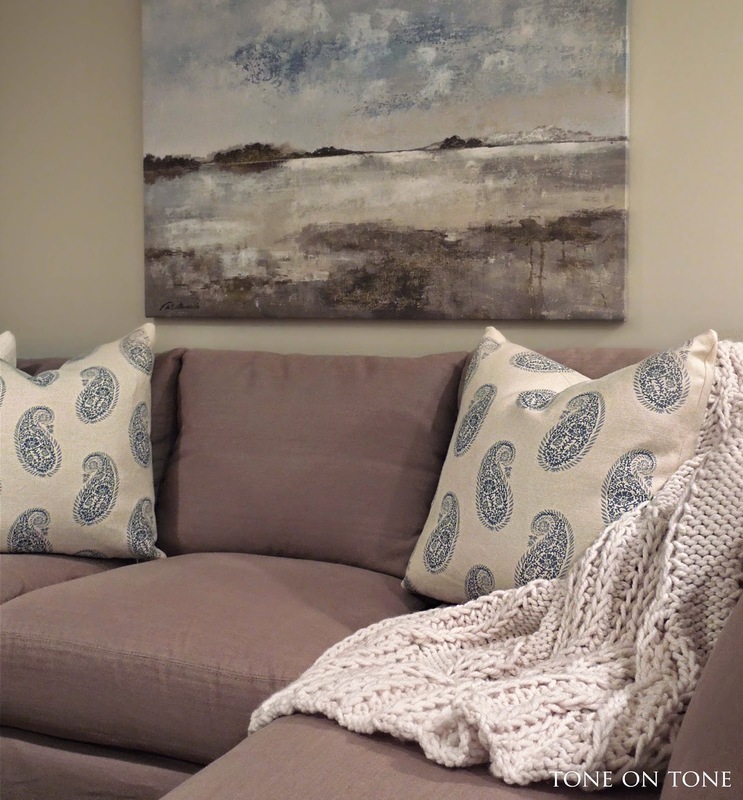 I took the stiffness out of the boxy sectional by having it slipcovered in a (brown) linen fabric. I wanted tailored lines but with wrinkles and crinkles. 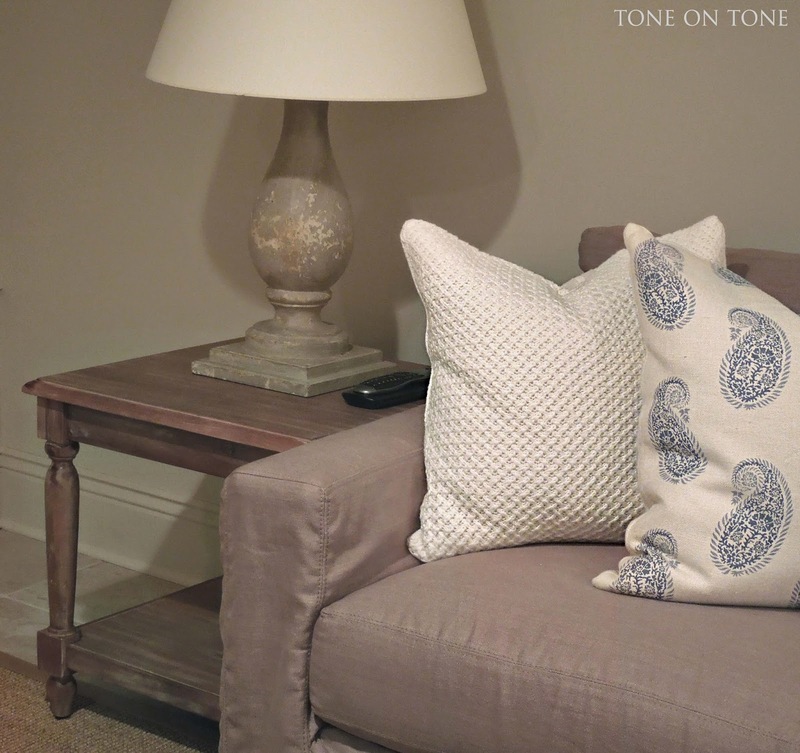 The linen paisley fabric on these pillows is Chamba from Peter Fasano. 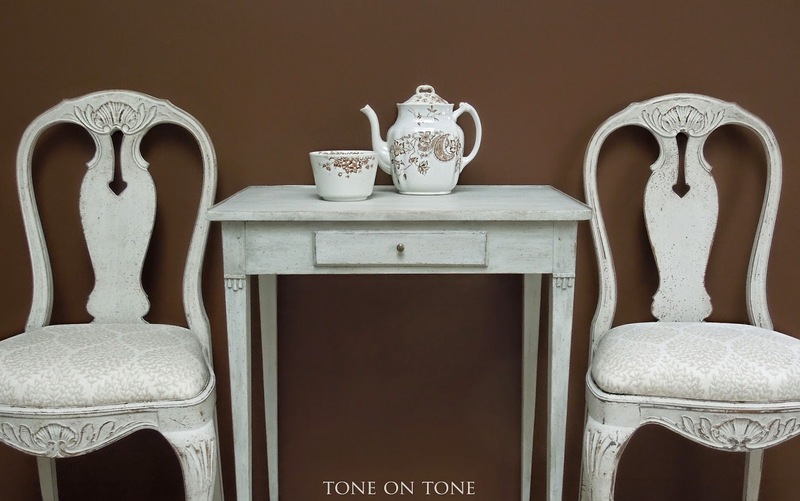 Antique baluster lamp is from Tone on Tone. Guess where I found the side table and painting? Go ahead! Side table came from World Market. Painting from HomeGoods :) Throw in a few antiques and custom pieces and those big box store finds look rather special. Anchoring one wall is this Art Deco zinc garden panel from our shop. With our low ceilings and lack of windows, it adds height, texture and impact. 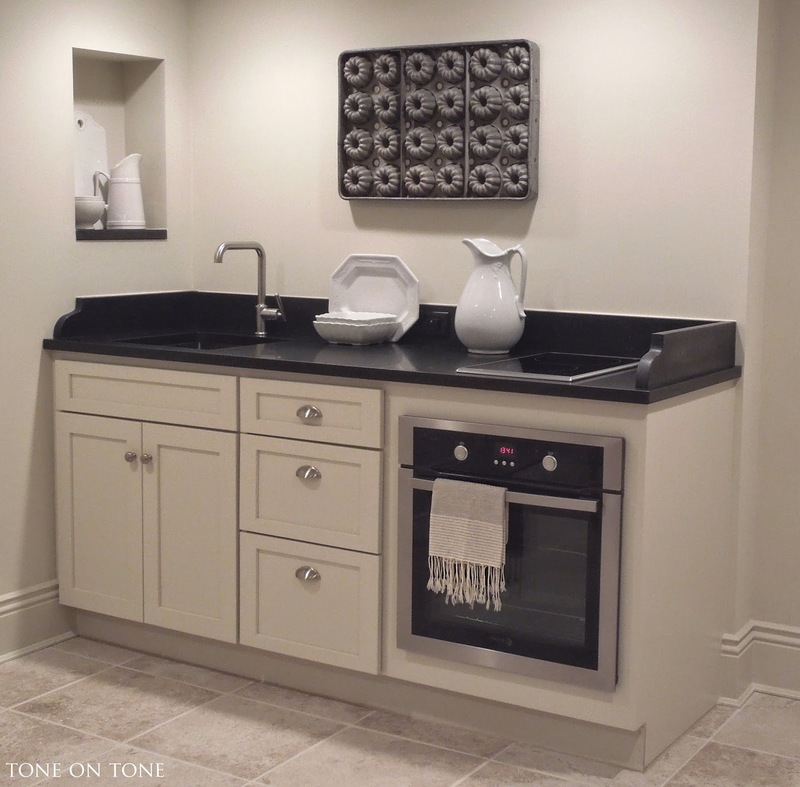 Behind the sectional is the kitchen. I found the vintage steel bakery pan for mini bundt cakes at an antiques shop, and thought how cool for our little kitchen! 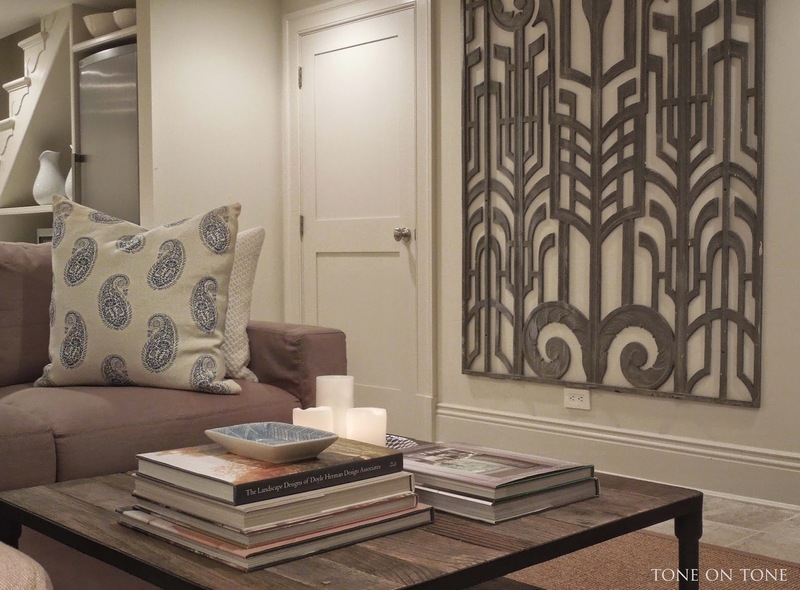 Plus I love how it speaks to the Art Deco panel - both are metal with graphic patterns. 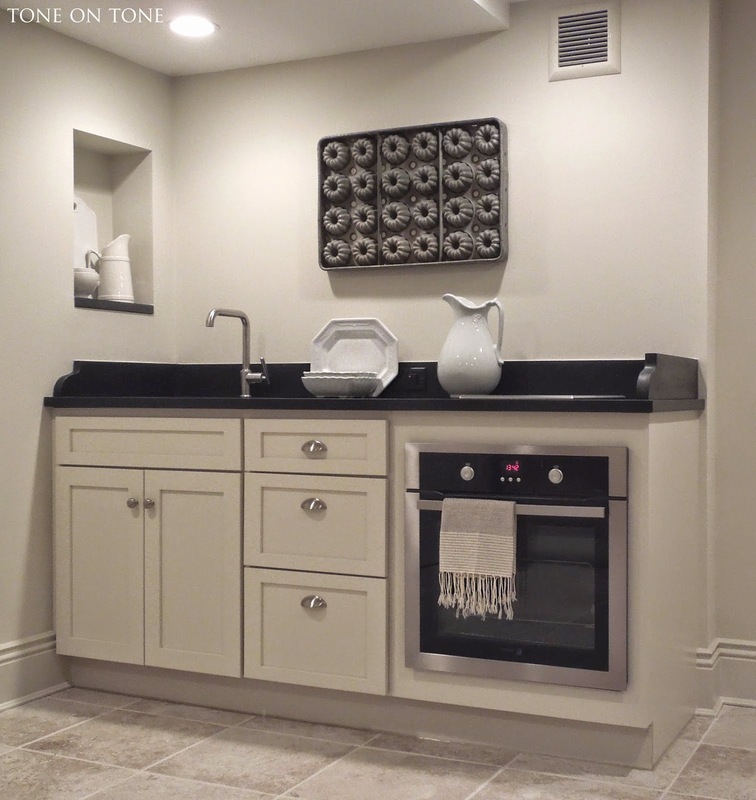 Why have a kitchen in the basement? Well, for snacks during TV shows, and for our guests staying in the bedroom. Cabinet doors are overlay (as opposed to inset) because they are budget friendly. 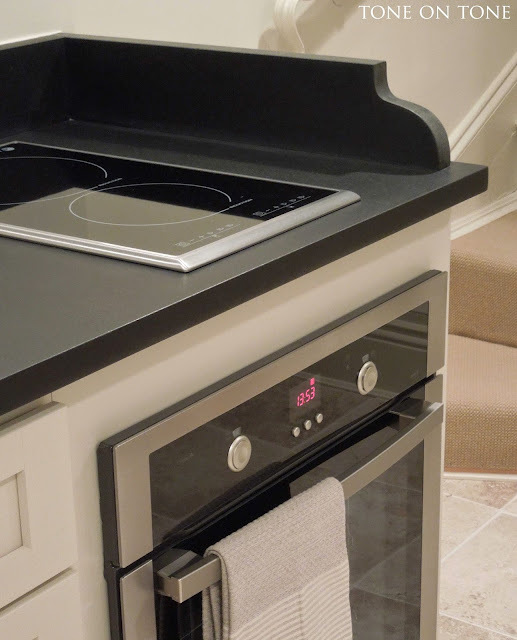 I had so much fun designing this 72" kitchen as well as hunting down the apartment sized appliances - mostly European due to compact size requirements. See sources at the end of this post. Many thanks to Appliance Builders Wholesalers (ABW) in Silver Spring, MD. Steve Scarborough at ABW was terrific - very friendly and knowledgeable. 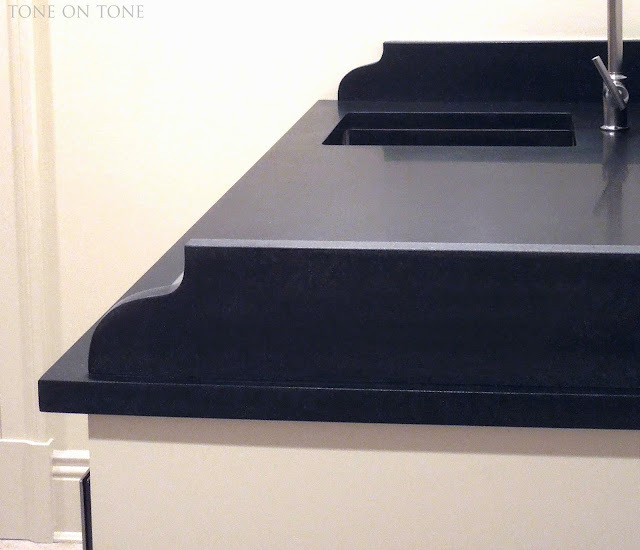 Counter top is Absolute Black granite. 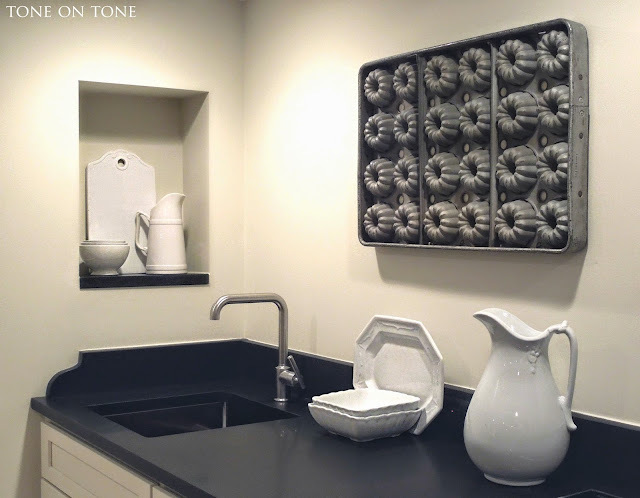 I designed the backsplash to look like a raised gallery found on furniture. Notice the freestanding endpiece and the bracket detail. Since this is an old house, storage space is limited. 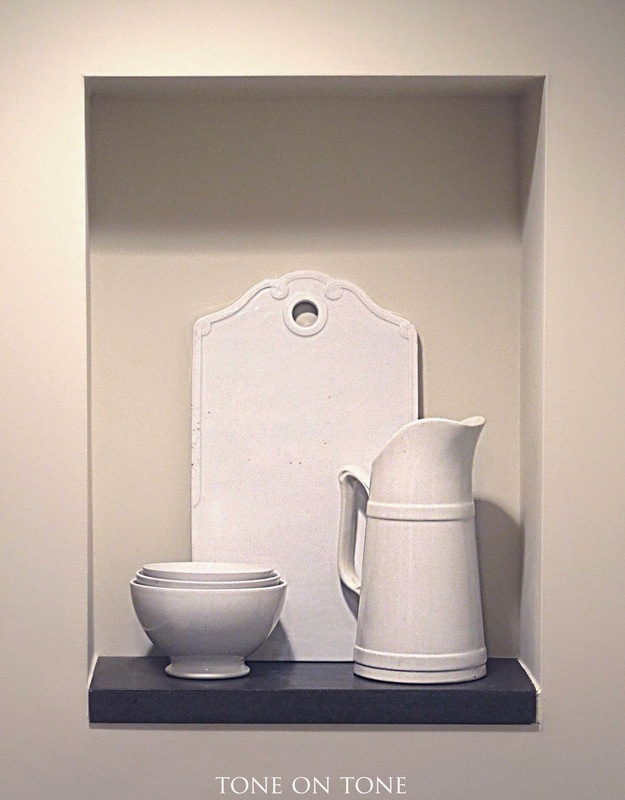 Therefore I carved out little niches in walls and even utilized the space under the staircase for the microwave, fridge, etc. 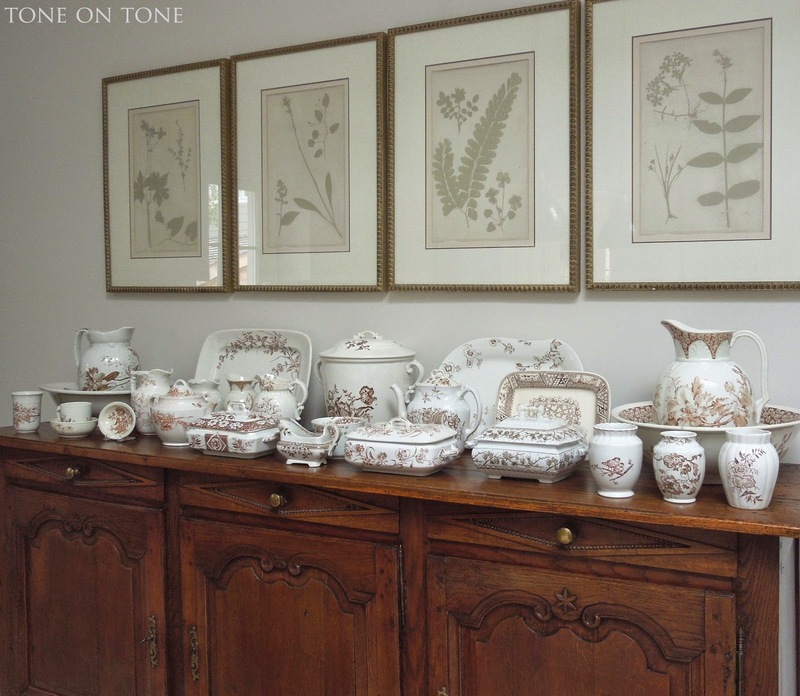 Currently my oversized ironstone pieces are stored here - soon going to our shop. 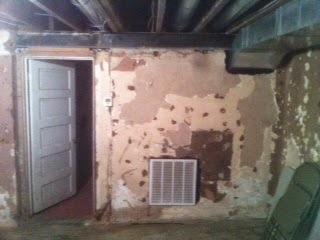 Now here are before photos. These two show the basement when we found the house. Lovely, right? Above is during renovation. 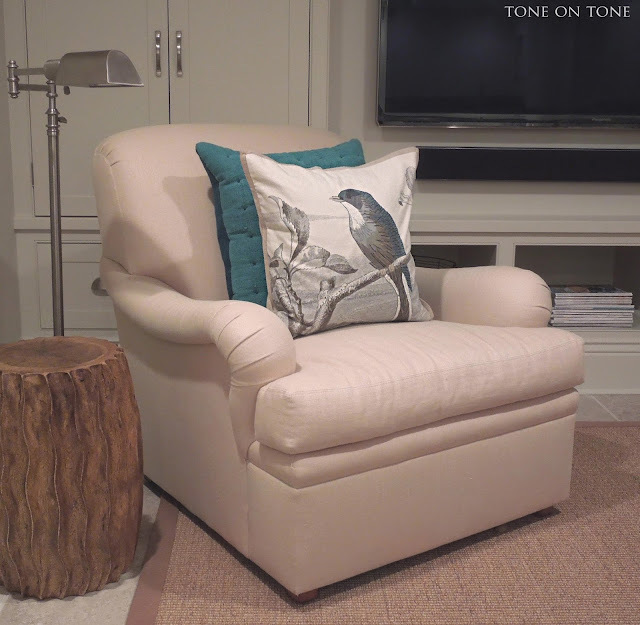 This is the corner where the clubchair sits. The HVAC duct is concealed inside the built-in. 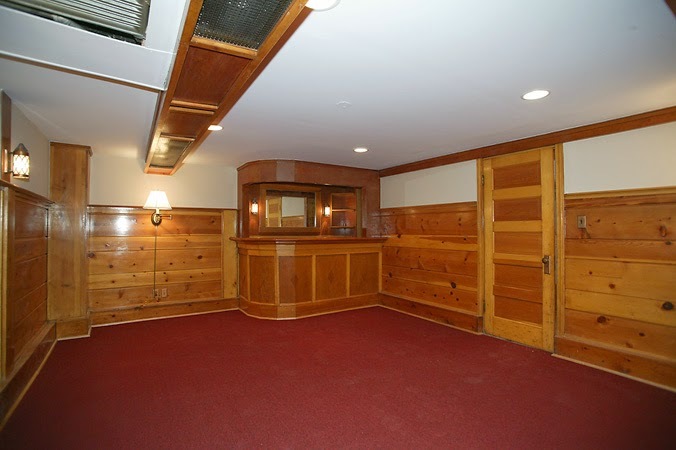 I hope you have enjoyed our basement renovation. 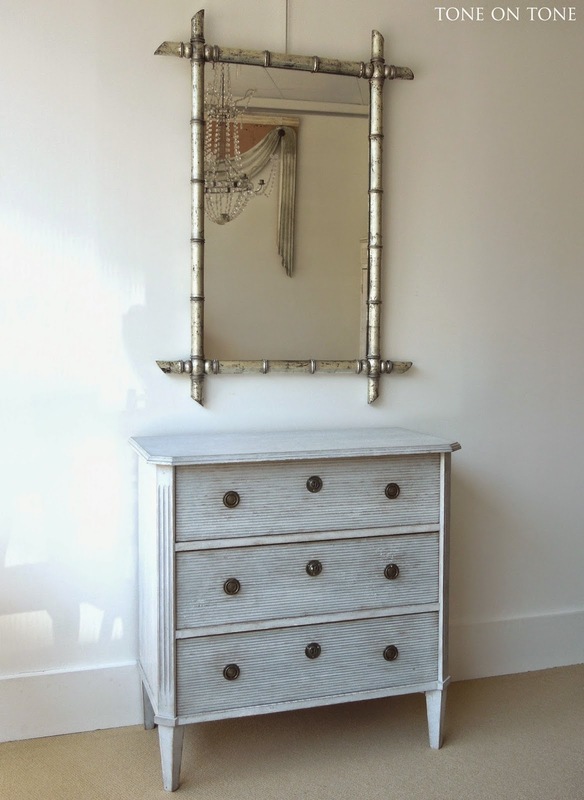 I'll share the bedroom, bathroom and workshop in a future post. If you have a question, please feel free to ask in the comments section. I hope you are well! Tom and I have been busy transitioning into this month of "gathering." 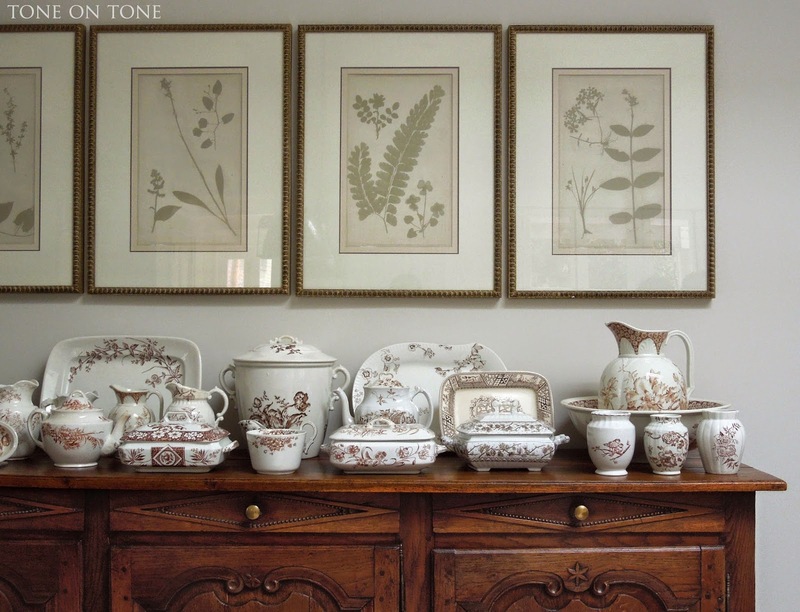 To get the house ready for company, we're tidying up inside and out, washing the china, and polishing the silver pieces. You should see our mini production line for these domestic chores. The dogs are, of course, not pleased as their favorite blankets went from "well loved" to squeaky clean. And their old beds got tossed out. 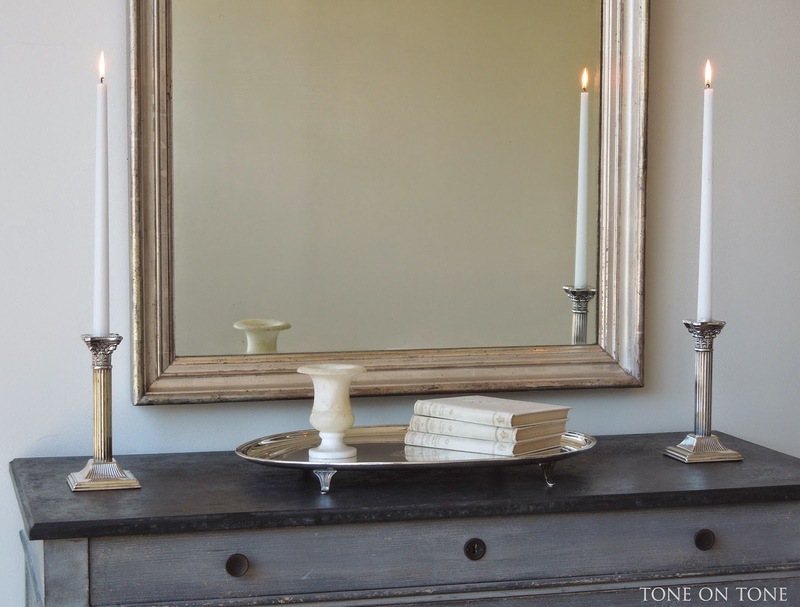 After all that polishing, I decided to create a few silvery shop vignettes inspired by the cool light now upon us. 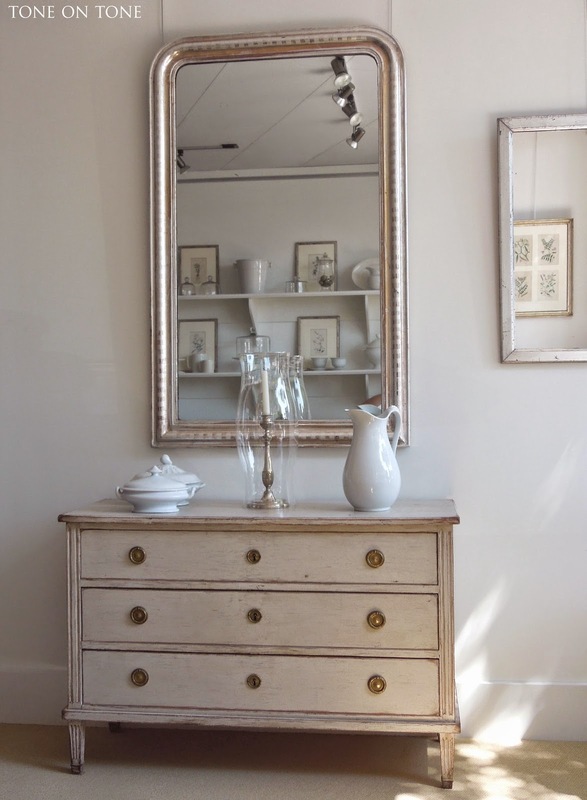 Here is a Swedish Gustavian chest and French silver leaf mirror with beautifully oxidized glass at Tone on Tone. 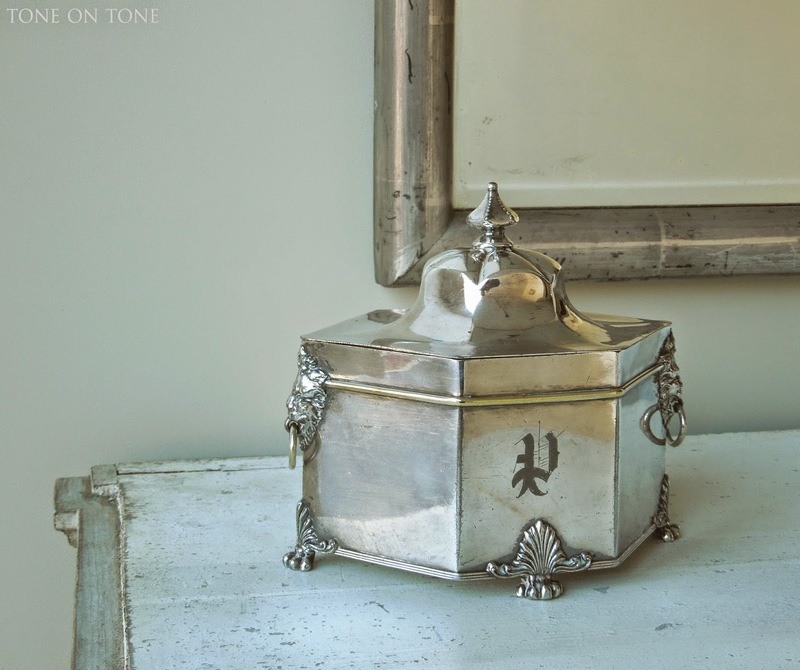 Below is an American tea caddy. 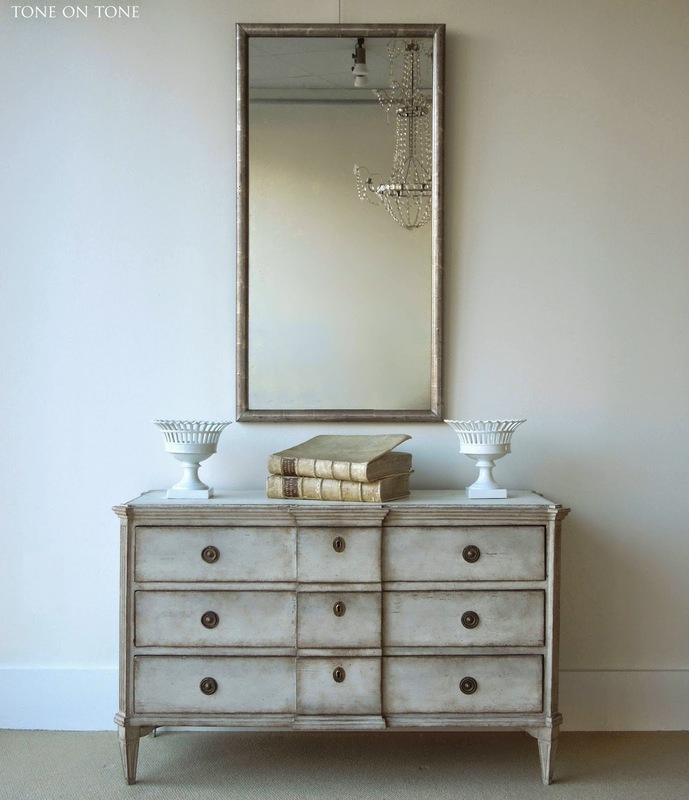 Despite the cool tones, these antique items possess a warmth and patina from age, handling and nature. Their spirit, though classical, feels modern. 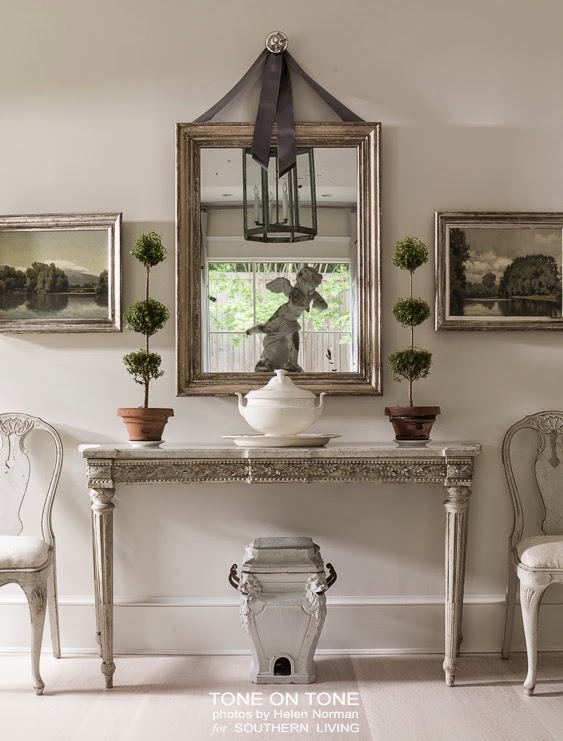 This vignette of French silver leaf mirror over gray chest is heightened with silvery accessories such as the framed graphite drawing and candlestick. 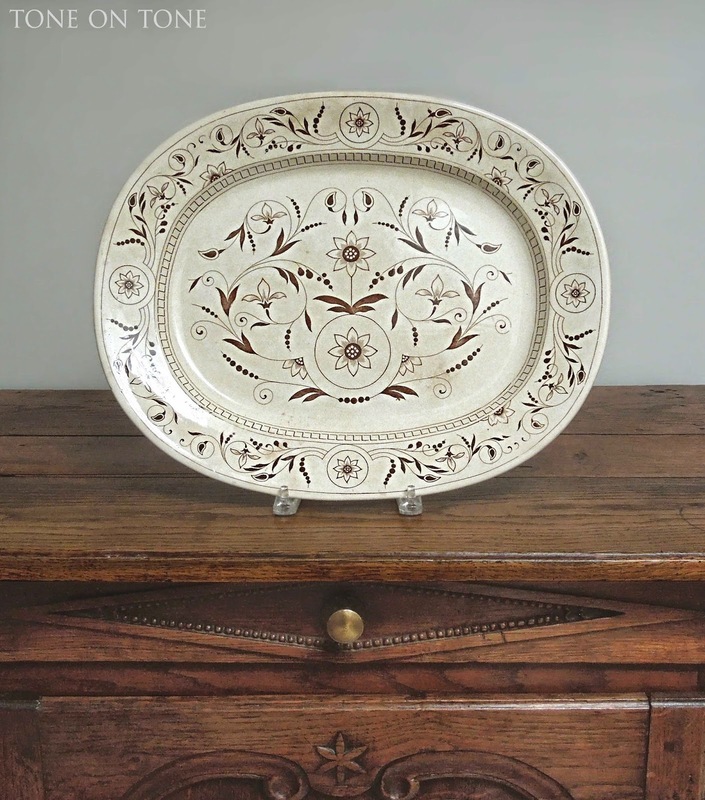 A footed oval tray with an unusual coat of arms having a broken arrow held in hand. I don't know anything about it. Do you? Perhaps it came from a family with an archery connection? 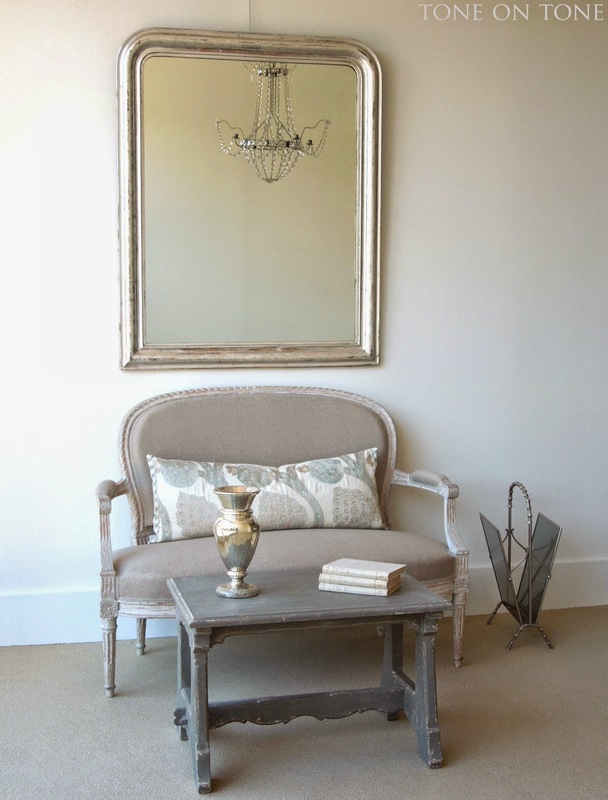 ABOVE: A 1900s French silver gilded mirror with faux-bamboo frame. 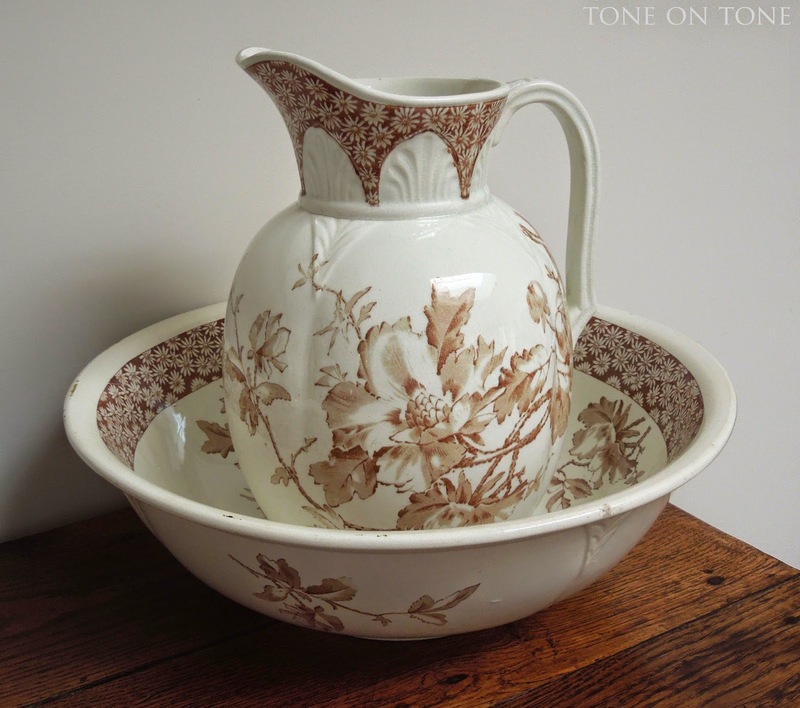 Wouldn't it look chic in a powder room with a geometric or floral wallpaper? 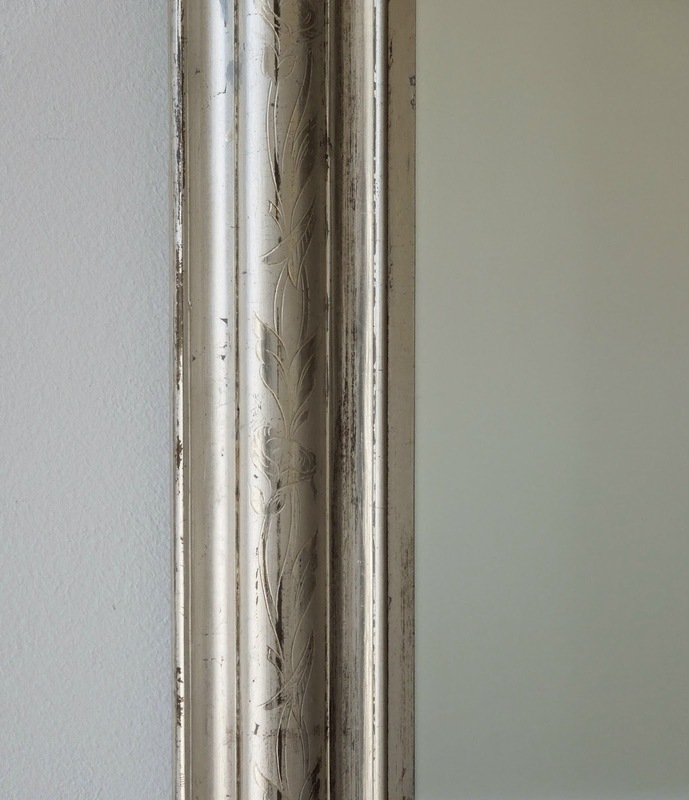 Two French Louis Philippe (Ca 1870-90s) mirrors with signature rounded top corners. 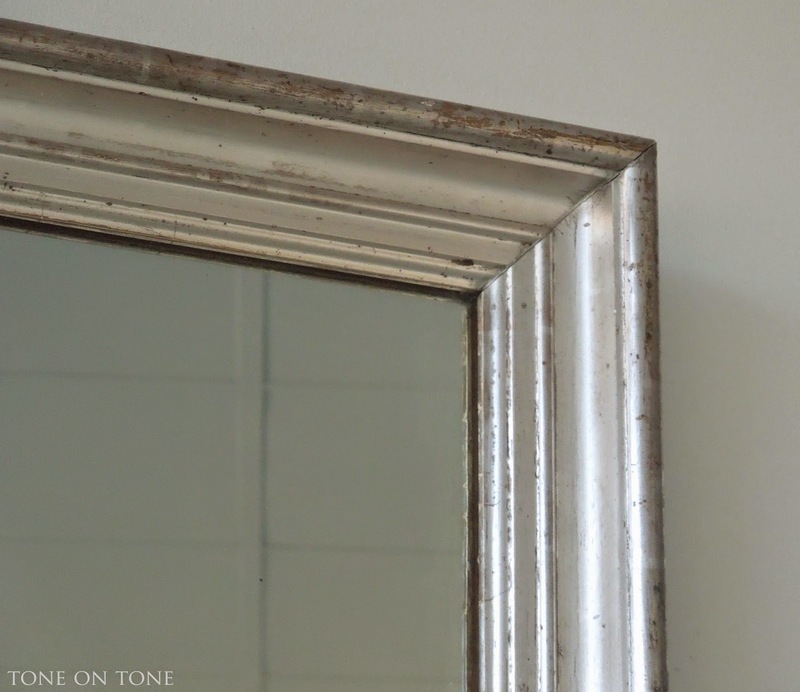 A closer view of the etched frame. 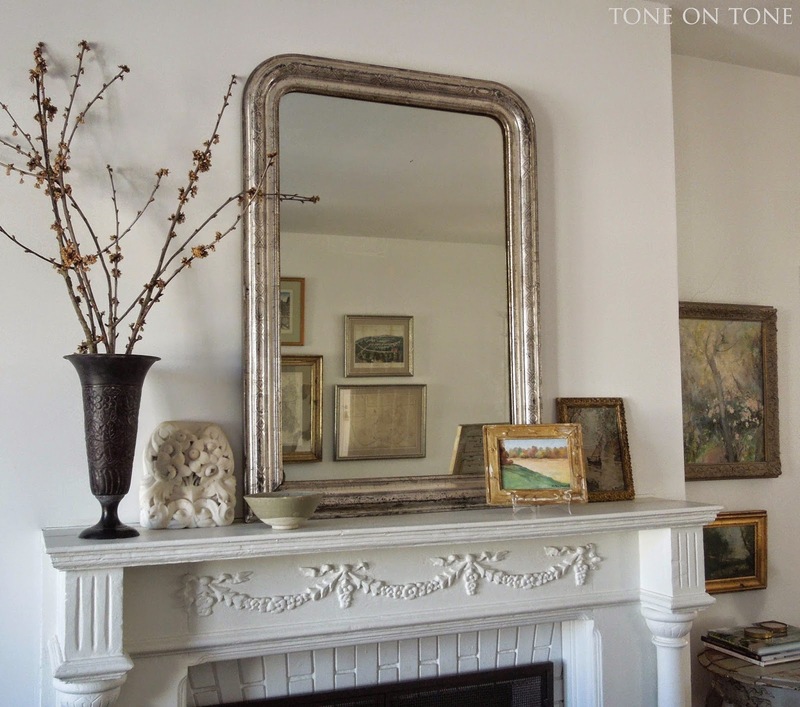 Now a look at some silver mirrors in situ, starting with this Louis Philippe beauty over a fireplace in my client's home. 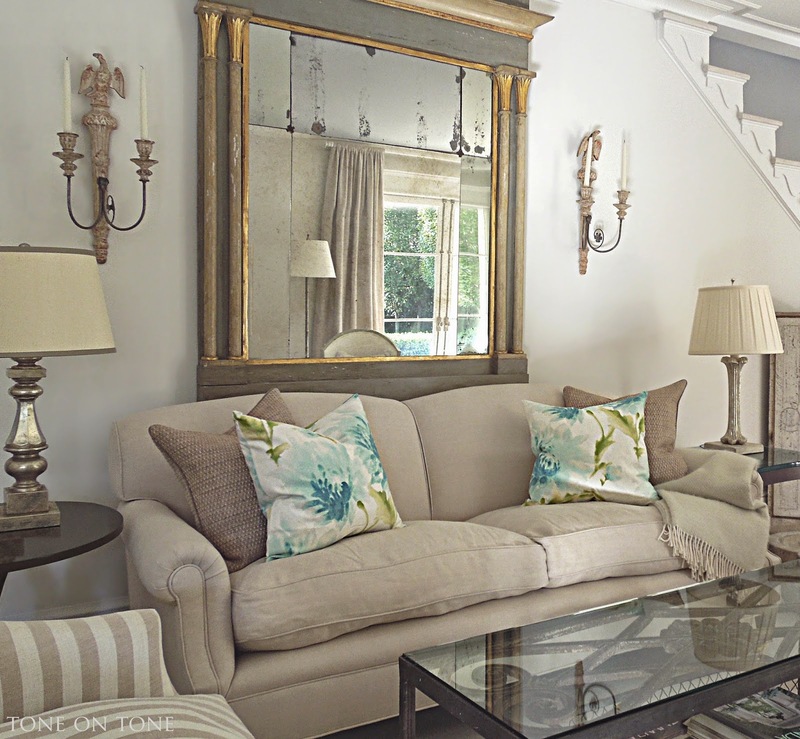 See more of this lovely home here. 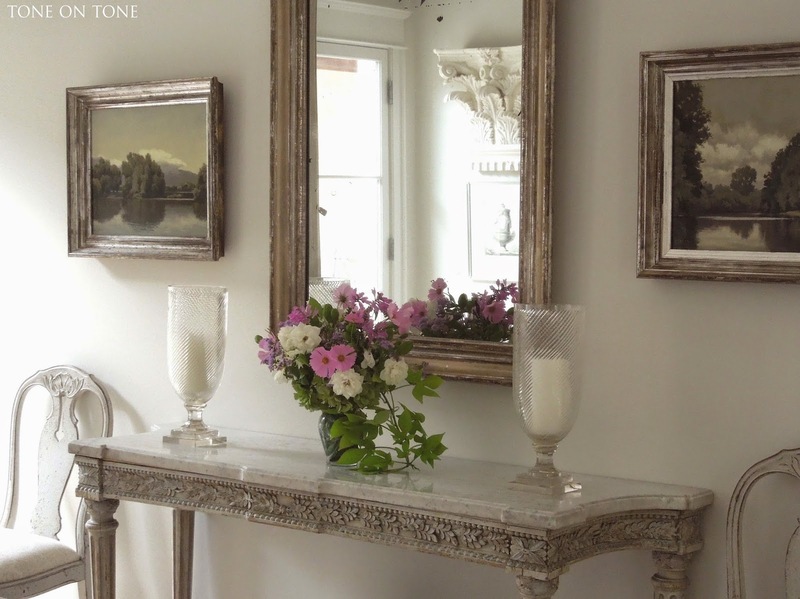 One wall of our dining room is decorated with a mirror flanked by landscapes, all with antique silver luster frames. 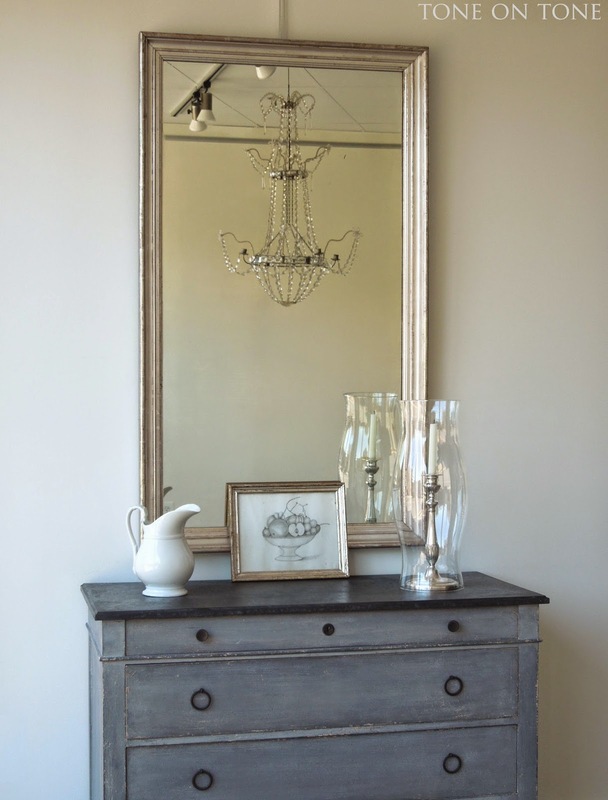 I think the mirror's frame, which is worn down to bare wood in many places, makes the formal console more approachable. 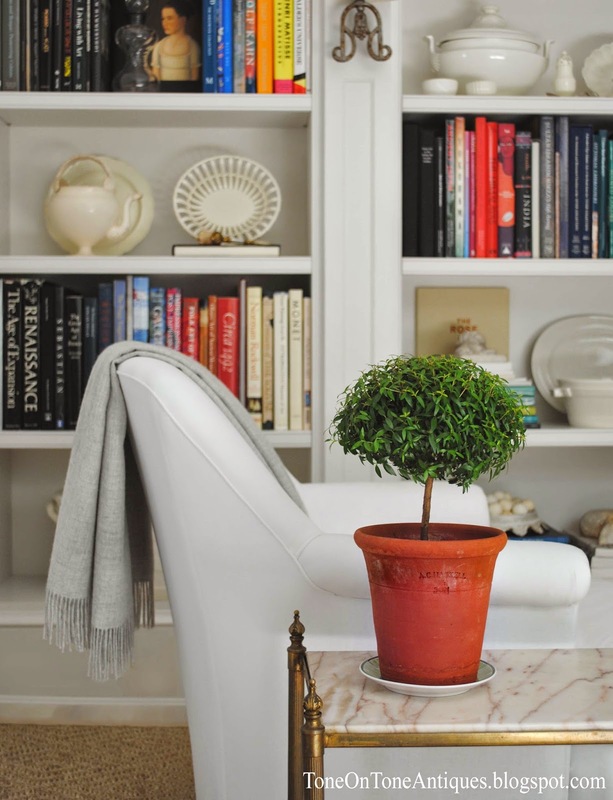 Two photos of my myrtle topiaries shot by Helen Norman for Southern Living earlier this year. 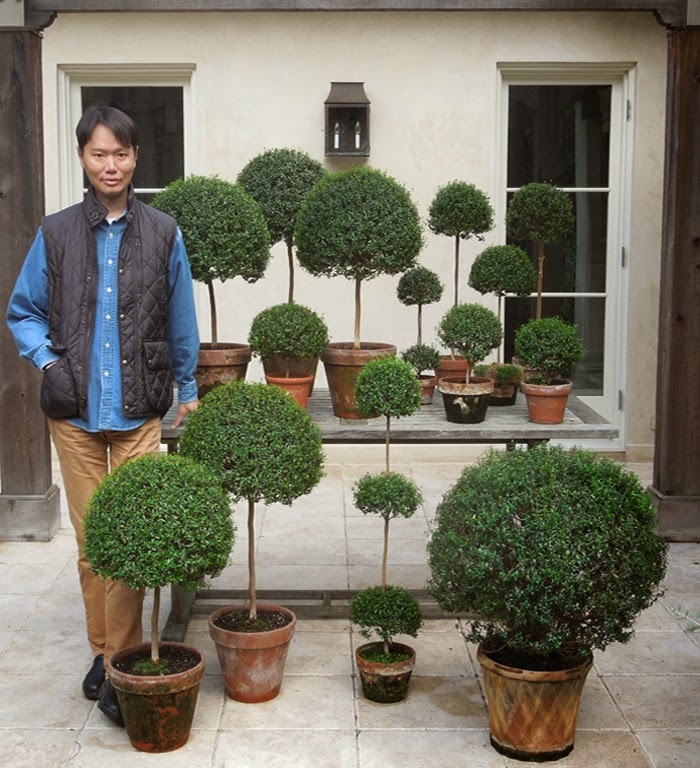 Speaking of topiaries, every year at this time I begin bringing them inside. Gathered here are just a few. Using myself as scale, you can see their size. Because I'm running out of sunny windows, I've decided to let a few go :( If you're interested in purchasing a topiary, please stop by the shop. Sorry these cannot be shipped - too fragile. Did I need these pillows? No! The price was simply irresistible, plus they reminded me of pretty abstract watercolors. Also picked up a runner that we're using as one long place mat, a white cast iron Dutch oven, and a farmhouse style fluted bowl. 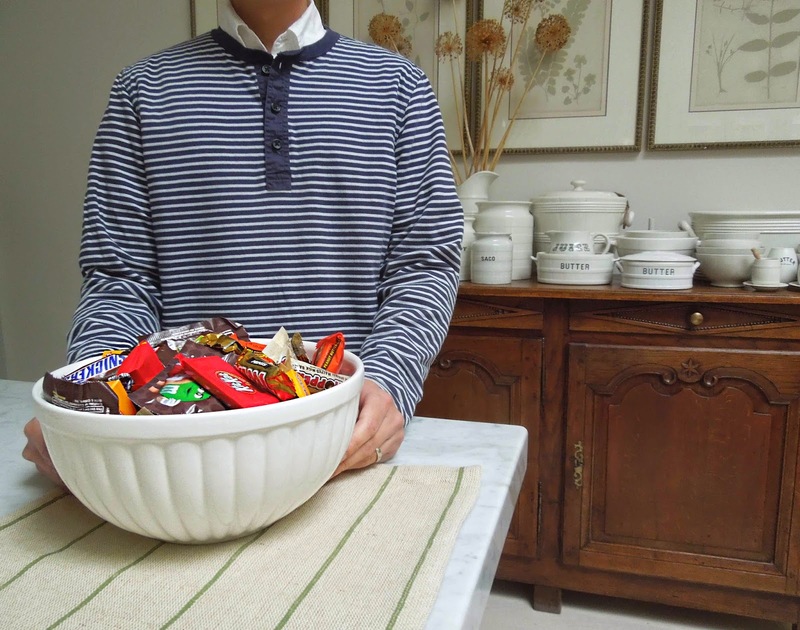 Perfect for the Halloween candy of which we have way too much. Come see me at the shop for your treat - no costume needed!